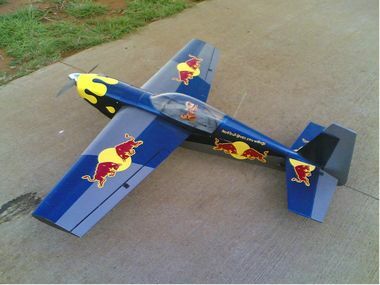 Since our humble beginnings at 68 Air School (68 AS) - then known as School for Logistic Training (SLT) - (located in Lyttleton in Centurion) when the author started off with the implementation of radio-controlled flying as a recreational sport some 22 years ago way back in 1996 - basically to get the aircraft maintenance trade related students who were undergoing courses at SLT truly passionate towards aviation and also to give them an opportunity to actually put the theory they were being taught in the classrooms into practice (especially for the aircraft mechanic trade) as well as for numerous other technical aspects of aircraft maintenance as a whole, radio-controlled model flying has truly risen from its infancy days in the military and grown into a full-blown sporting code with the Pretoria Military Sports Club (PMSC). 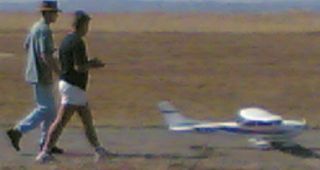 As there were no facilities available at the time, we started off by scraping a runway to the west of- and parallel to the south-western fence line of the technical area on the southern side of 68 AS, but after a short few months we soon realized that this was seriously risky due to the fact that we were flying directly within AFB Swartkop's (AFB SWKP)circuit as well as causing serious distractions and a number of near-collisions for the motorists using the adjacent Hans Strydom Rd (running from east to west and lying to the south of said flying site) who were watching our low flying antics during approaches across the road. 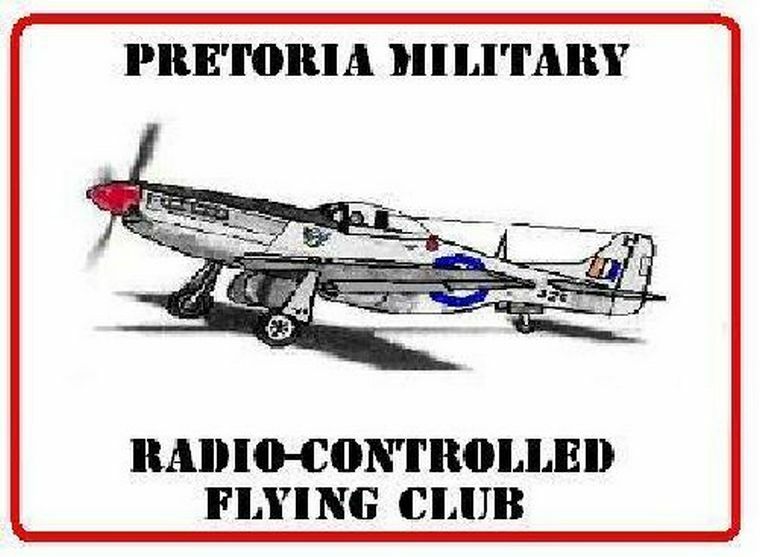 It was then decided to rather make use of the civilian radio-controlled flying clubs in the vicinity per agreement with the relevant Club Committee, and we then migrated to the old Irene Radio Flyers' premises which was - at that time - situated to the north-west of Centurion Licensing- & Roadworthy Department's current facilities in Nellmapius road (west of the DENEL Group's Kentron/Eloptro facilities). 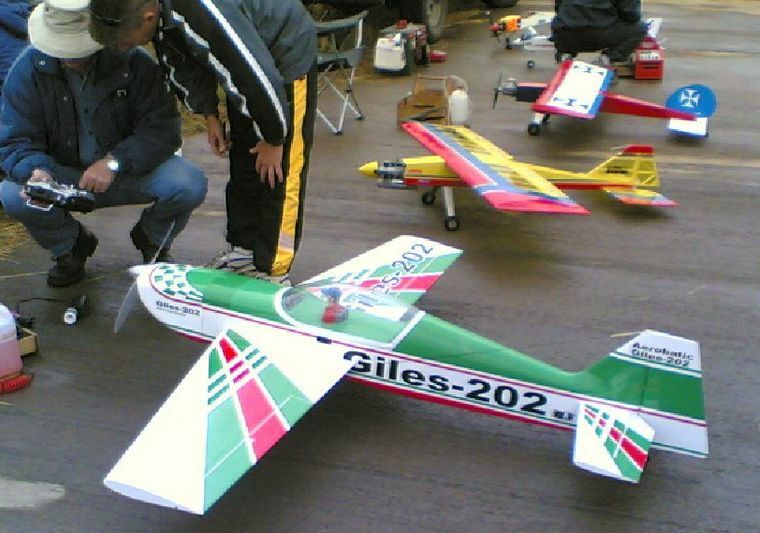 It was quite a hectic time as we had 35 active members on the sport order, some of them even driving radio-controlled cars on the dirt runways inbetween model aircraft operations. 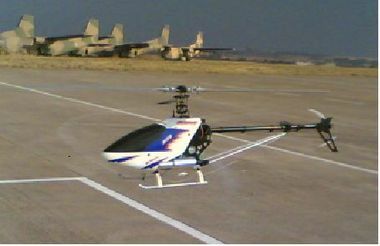 We operated so intensively at the time that we received a letter from the Centurion Licensing- & Roadworthy Department requesting us to trim down on our activities as we were driving the people in the main building "mad" on Wednesday afternoons, as we had no choice as to approach right over the main building in order to line up for landing from the south on the main dirt runway of the old Irene Club. 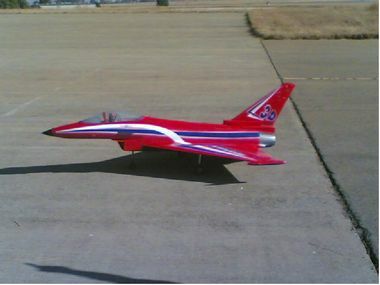 We then diverted to Rosslynn Aero Modellers' (RAM) old facility (then located north-west from Rosslynn industrial area to the north-west of Pretoria on the Pretoria/Brits road) where we could fly undisturbed. 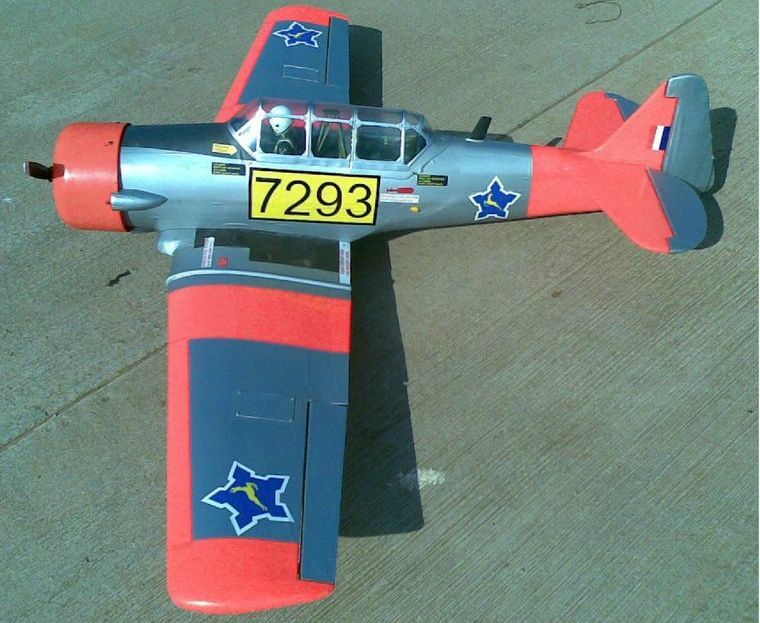 After approximately another year's flying, the members suggested that we find a venue closer to 68 AS, as RAM proved to be too far to travel to for some members, especially members living in the Witwatersrand area. 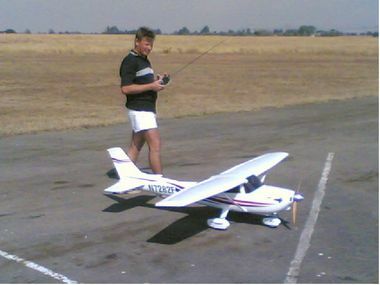 The author then moved to Centurion at that time and joined White Hills Radio Flyers (WHRF) club, and after some negotiations with their committee, the Wednesday afternoon activities were migrated to their current premises to the west of Wierdapark on the Knoppieslaagte road, as it was far from any residential areas, shopping centers, busy roads or businesses. 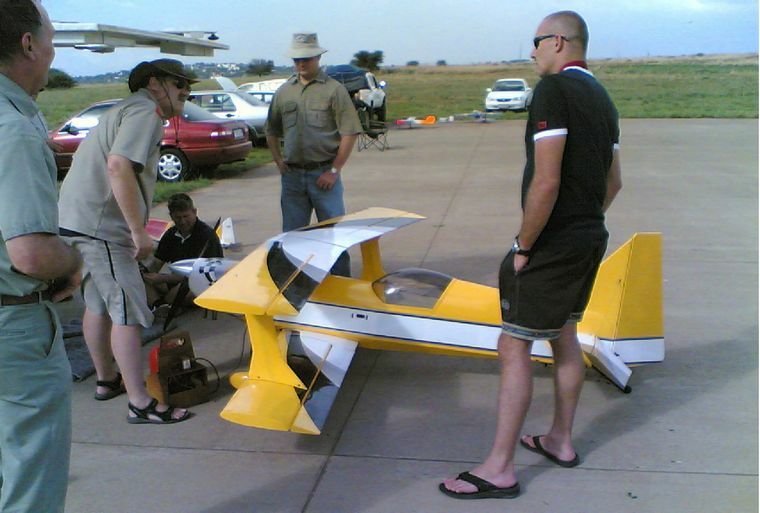 However, as soon as we moved over to WHRF, word spread like wildfire throughout the South African National Defense Force (SANDF) units in the Pretoria area, and we quickly started to become a "problem" for the WHRF Committee on a Wednesday afternoon, as our membership grew rapidly in numbers, causing us to have more models flying on a Wednesday afternoon than what WHRF would have over weekends. We did - however - have no choice but to continue making use of WHRF for about a further two years until we decided to start investigating the possibility of obtaining our own facilities preferably located on military premises (for security reasons), and within the Pretoria area, and it also simultaneously became obvious and quite clear that this "informal club" will not only have to find its own venue, but will also have to be "officialized" and managed accordingly as a formally structured radio-controlled flying club, leading to the long process that was to follow to get our sport recognized as an official sporting code within the SANDF. 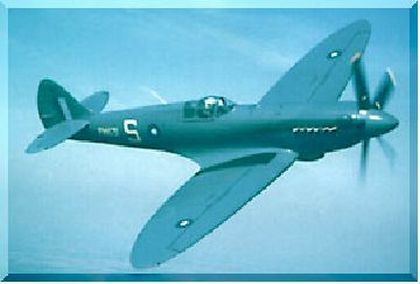 During the latter half of 2002, when a definite need was identified to accommodate not only South African Air Force (SAAF) members in the sport (which was then still recognized as a leisure sport) on a Wednesday afternoon during sport parades, but to also accommodate members from all the other arms of service within the SANDF- (as well as a number of civilian members) and also due to the fact that the popularity of the sport suddenly skyrocketed and numbers grew rapidly, it was then - with the much-appreciated help of an old friend in the form of Lt Col Werner Dillman - the Sport Officer of Air Force Base Waterkloof (AFB Wklf) - that we applied with the PMSC to have our sport affiliated and approved as an official sporting code within the SANDF. 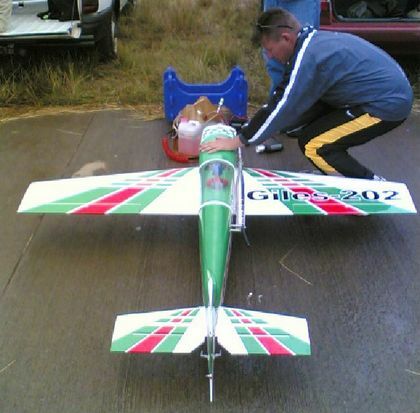 This process took quite a while to complete, and eventually during 2003, final approval was granted and Radio-Controlled Flying became part of the current bouquet of some 42 sporting codes currently approved and acknowledged within the SANDF, and was also officially registered as the Pretoria Military Radio-Controlled Flying Club (PMRCFC) with the now-obsolete RAF PR Mk 19 Rolls Royce Griffon-engined Spitfire in the picture to the top-left of this page as the-then official PMRCFC emblem. 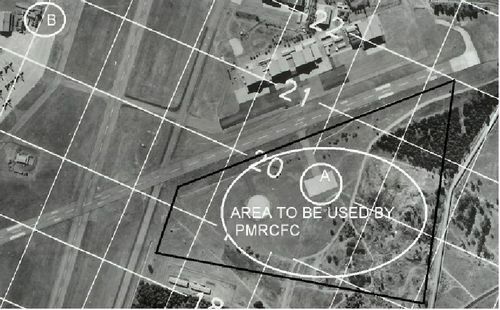 Meanwhile, the concrete slab (marked as area A on the aerial photograph & originally built as a "hard-stand" area and engine ground testing bay for 60 Squadron's fleet of Boeing 707 aircraft) located directly south of the now-disbanded 60 Sqn's existing facilities across to the southern side of runway 06-24 at AFB WKLF, was identified as a very preferable, ideal and indeed absolutely excellent location for the execution of radio-controlled model aircraft flying activities and the "paper war" to obtain this area as "home base" facility for the PMRCFC was started, as this was ideal due to the vast open area with basically NO trees or bushes for approximately 500m IN ALL DIRECTIONS surrounding this 75 x 150m concrete slab that is connected to runway 06-24 by a 50m wide- & approximately 350m long taxi strip- truly making this a radio-controlled flying runway extraordinaire as this "runway" is located directly in line with the prevailing wind direction (usually blowing on heading 330 from the north, and -150 from the south)! The ideal "nest" for the PMRCFC had - at last - been located and secured for the PMRCFC's use on Wednesday afternoons. 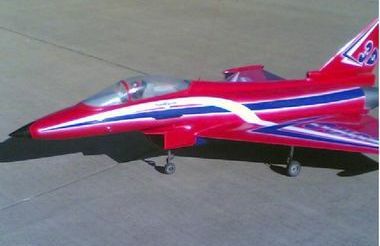 It was - however - only during August of 2005 (after another lengthy session of correspondence between the PMRCFC and the relevant role players at AFB Wklf and with the help of the current Vice Chairperson- and Chief Flying Instructor Fsgt Johan Groenewald) that we managed to obtain all the necessary written consents and subsequent permission and relevant authorizations from the Chief Air Traffic Control Officer (CATCO)-, the base flying safety officer- (BFSO), the Air Wing Commanding Officer (AIR WING CO)-, as well as the Commanding Officer (CO) of AFB Wklf to continue with our model flying activities on our new venue. Following several months of negotiations and submitting and re-submitting documents, the go-ahead was eventually obtained with all the necessary safety arrangements being in place with the resident role players of AFB Wklf. So, during August 2005, we eventually started operations from our very own facilities, from then on visiting WHRF only on the 1st Wednesday after the 15th of each month to render the members the opportunity to braai, as we could not do so at our new facilities due to the close proximity of military installations and the accompanying danger of a runaway veld fire, being surrounded by grass veld. The membership of the PMRCFC currently exists of quite a number of members having been recruited into- and started-off in the sport with us as a club, as well as having been trained by our very own instructors. 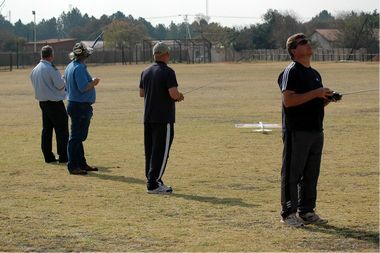 We also recently went through the compulsory exercise of registering our facilities (with the help of Mr Bob Skinner from South African Model Aircraft Association [SAMAA]) with the SAMAA, the South African Civil Aviation Authority - SACAA), as well as with the Aero Club of South Africa which means we are now fully legal and -registered (the first time ever in history that an official SAMAA-registered radio-controlled flying club had been registered with a military airfield as their official location) with the new emblem depicting the North-American F-51D Mustang tail no: 325 which was used by 2 Squadron SAAF during the Korean conflict in the early 50's & on display at the SAAF Museum at AFB Swkp. 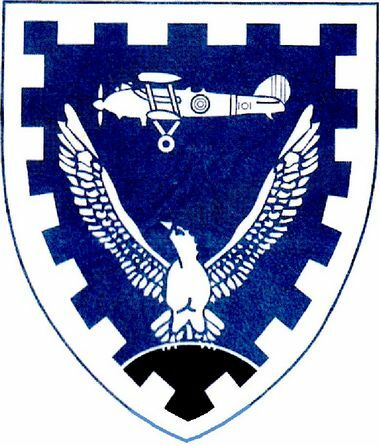 It was decided on this emblem due to the fact that it is more military aviation-wise historically correct - especially for the PMRCFC as a club within the military- and which is now proudly being sported as the official PMRCFC emblem as the official letterhead on all correspondence from the club itself, as well as in embroidered badge form on our member's clothing. 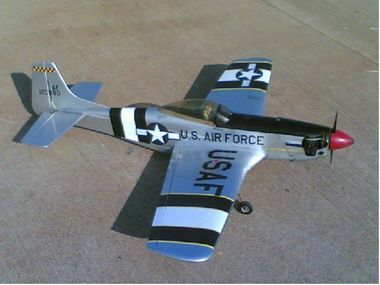 A giant slightly-altered version has also been embroidered on the back of some of the member's winter jackets, accompanied by the normal-sized club badge on the left chest which will shortly be accompanied by a beautiful set of embroidered pilot's wings, similar to the wings depicted on the solo certificates shown later on in this article. But - alas - we endured there with NO water-, or ablution facities up to August 2012, when we moved over to Mobile Deployment Wing's (MDW) facilities, and managed to obtain the flightline to the west of the hangars @ MDW as our new home, which included water- & ablution facilities close by, as well as having had a smallish pre-fab building allocated as a clubhouse to us by the then OC: AFB Swkp: Col (now Brig Gen) Eddie Crous, & we also managed to convince him that we need to paint the outlines of our runway, taxi ways, as well as flightlines for better discipline for the pilots whilst being on the ground, as well as to aid them in developing their precision landing skills, as they now had a runway threshold for which to aim for on touching down during their short-final approaches on the runway itself, & not landing anywhere which - in itself - posed a serious safety problem at the time, as anyone would take-off from anywhere in any direction whichwver the wind might be blowing that particular day!! We made use of this facility for approximately two years, even flying there on Sundays, but it was - however - as a direct result of a civilian chopper taking a shortcut over Snake Valley one Sunday morning & almost having a mid-air collision with one of our model aircraft, that we were formally instructed by the Chief Air Traffic Control Officer (CATCO), that it would be better to move over to the flightline on the premises of the South African Air Force (SAAF) Museum on the main (western) side of AFB Swkp, for flying safety's sake, as it would place more that enough space between us & the civilian aircraft transiting along the length of the Ben Schoeman highway (& taking a short cuts to Lanseria International Airport over our designated flying area @ MDW). 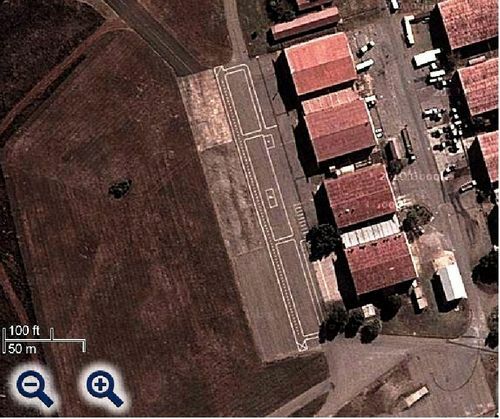 So we unintentially ended-up having the "best radio-controlled model aircraft flying site in the world", as our home base (& as can be seen on the photo on the left, the home of the PMRCFC was also registered on Google earth by the Chairperson). Up to date the PMRCFC has only gone from strength to strength and the member numbers escalated as members of the other Arms of Service (S.A. Army, -Navy and -Military Health Services) also joined up. 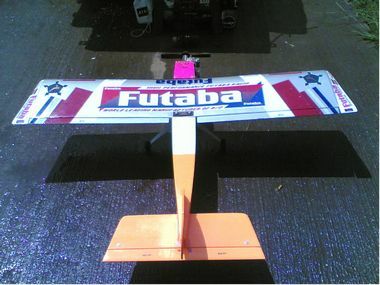 We've had several forms of radio-controlled model flying activities at our facilities since then, with the likes of well-known model pilots like Neville Wright, Zane Mannell, Chris Freeman, Dean Grobbelaar, Boet Denysschen, Francois Diedrichsen and Neil van der Walt who flies their hi-tech, hi-speed gas turbine-powered jet models at the PMRCFC from time to time, as well as some very large models flown by the likes of Andr� Beukes or Dirk Visser - to name but a few. 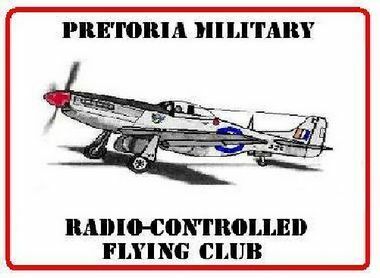 Mr Gert de Klerk (retired Lt-Col who initiated-, but have since handed over the organizing & hosting of the annual "Warbirds Weekend" fly-in event to the PMRCFC), is also an active member with the PMRCFC. We've had 15 pilots with some 25 aircraft on our flightline (that is actually the correct name to be used when operating model aircraft, as the well-known "pitts" is actually the correct word only to be used at radio-controlled model car race track facilities) at times which is quite impressive for a Wednesday afternoon, and clearly indicates that the PMRCFC as a club is definitely going from strength to strength as time progresses. Since those early days we were not to be stopped at all, as we currently still maintain the highest levels of flight safety (possibly within the whole model aviation fraternity in the whole of the RSA, or even the world) due to the fact that we firstly have to obtain clearance from the Air Traffic Controller (ATC) on duty in the AFB Swkp control tower prior to commencing with any flying activities on a Wednesday afternoon from 11:30, and after having obtained the necessary clearance and briefing from the ATC's, we ALWAYS have a competent member manning the 2-way radio whilst he/she keeps a lookout for any full-size aircraft in the vicinity as the ATC's are to occupied at times to timeously warn us of any full-size aircraft that might be transiting out airspace in which case we just shout the command "EVERYBODY DOWN! 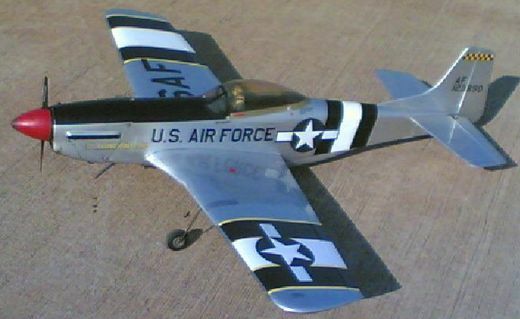 ", after which every pilot flying at the time IMMEDIATELY dives his model aircraft down to grass-top level and then either lands as quickly as possible in quick succession-, or keeps on flying low (whilst watching the full-size aircraft the whole time) until said aircraft has exited our airspace in order to avoid any incidents at any costs. This procedure is also followed on command from the ATC's at times when they deem it necessary for us to stop our model flying activities for a brief moment whilst flying activities of the full-sized aircraft becomes a bit to "hectic" for their liking. 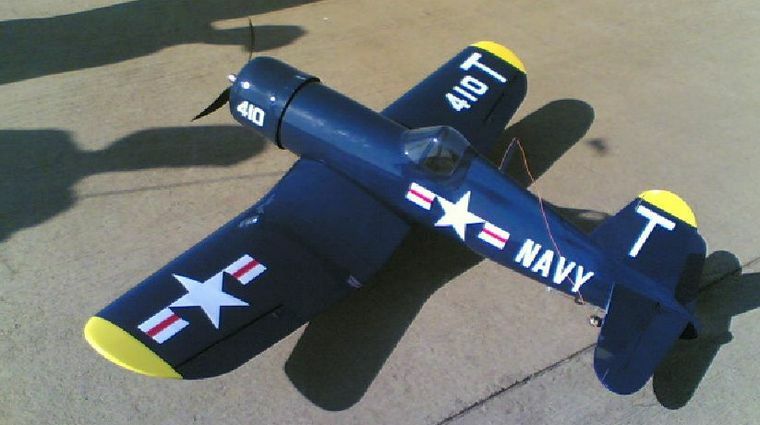 We have also used to make our mark in the Military sporting environment as we were high in demand to render "flypasts" during opening ceremonies for sporting days, or even to render model flying displays at such sporting days, but as always, we are in constant radio contact with the ATC's at all times. These activities have the advantage to render some exposure to our sport, and many a current member has joined us as a direct result of these activities. 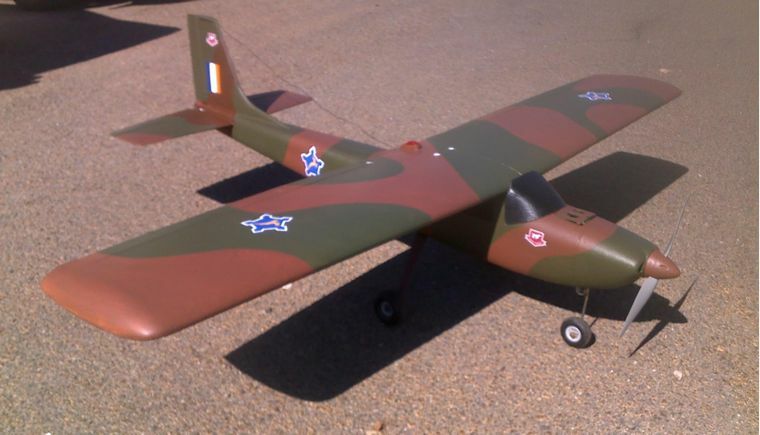 We have even at times flown virtual "aerial support missions" for the - now disbanded - Pretoria Military Paintball Club (PMPBC) during enactments of "hostage" scenario's under strict control of their Chairperson Fsgt Frikkie Geyser at the opening ceremonies - of especially - AFB Wklf sport days. 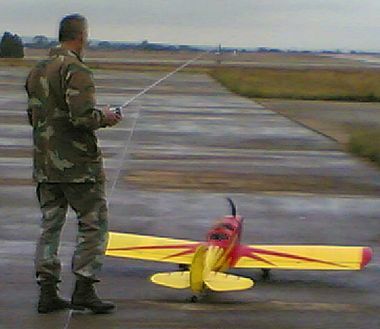 All these activities had the added advantage that Radio-Controlled Flying as an official SANDF sporting code has been awarded the most improved and promising sporting code of the year award for three consecutive years from 2005 - 2007. Although most of our members are South African Air Force (SAAF) members, but we also sport some S.A. Army-, and Military Health Services members as well. We also accommodate approximately 20 civilian participants at the club, with these "civvies" regularly joining us on a Wednesday afternoon. 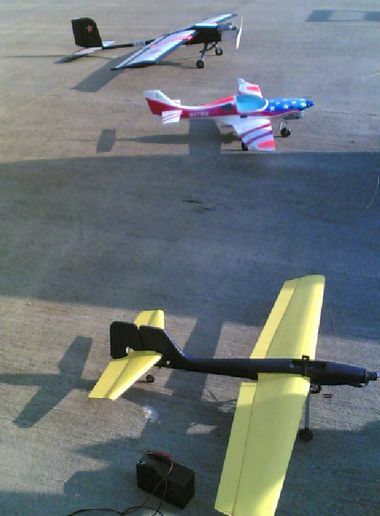 Our facilities are also more than ideally suited for the flying of giant-scale models, and a number of well-known pilots have complemented us on the excellent open flying area sporting more than sufficient landing space, especially on the main runway, being almost parallel to 02-20: AFB Swkp's main runway) which we are privileged to use every Wednesday afternoon, especially with the added advantage that the wind is usually blowing straight from the north-west down our main runway towards the south-east 99% of the time. Due to the fact that we are directly operating within operational military airspace from military facilities with military aircraft sharing the airspace with us whilst executing military missions funded by taxpayers, it entails that all model flying activities are ALWAYS conducted under very strict supervision from the Club Chairperson who is also one of the PMRCFC's Flight Safety Officers (FSO), and new members (as well as before the commencement of each day's flying) are thoroughly briefed and sensitized concerning the strict flying discipline that has to be applied, as well as the absolute critical essence to respond immediately to any command given by the FSO, and that ANY model pilot not adhering to commands (such as for eg. to fly low and then to land immediately as quickly as possible), WILL be grounded for the rest of the afternoon's flying - irrespective of the rank or age of the perpetratoR! AT PMRCFC FLYING SAFETY IS ABSOLUTE NO: 1 PRIORITY AT ALL TIMES. 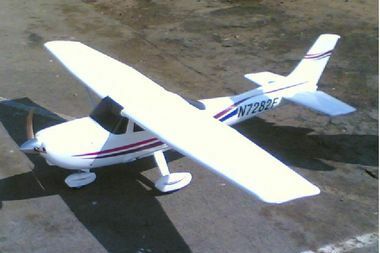 Amongst our ranks, we also sport a number of highly-competent instructors who have trained quite a number of "raw" student model pilots who have all successfully completed their solo flights and were awarded their individual solo certificates. 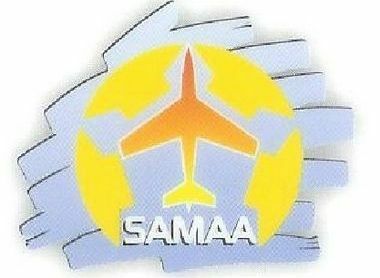 Our instructors are currently practicing the SAMAA-approved flying test in order to be rated by SAMAA as official flying instructors - preferably still before the end of this year. 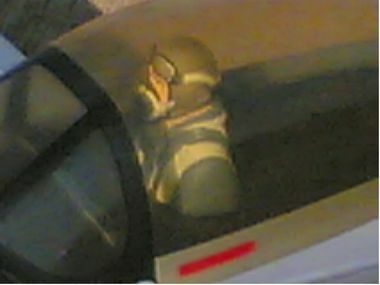 The quickest solo was done within three weeks, but this success can mainly be ascribed to highly-realistic computer simulation training for at least one and a half, to two hours at a time every day - a true testimonial to passionate commitment at its best! We have - as yet - not had any official competitions nor SANDF inter-unit leagues, but are planning to regularly have competitions as soon as there are more clubs within the SANDF in future, but we've had in-house competitions twice each year in the form of the Pretoria Military Sport Club's (PMSC) Gauteng Regional Sport Day, promoting healthy sportsmanship and camaraderie inbetween members, and have also had various accounts were members have engaged in World War 2-style Air Combat Maneuvers (ACM) - at their own risk and expense off-course - under strict supervision from the on-duty FSO - which has also caused the loss of the odd model aircraft in the process, but it is all seen as part of the "military" aspect of flight training at the PMRCFC. 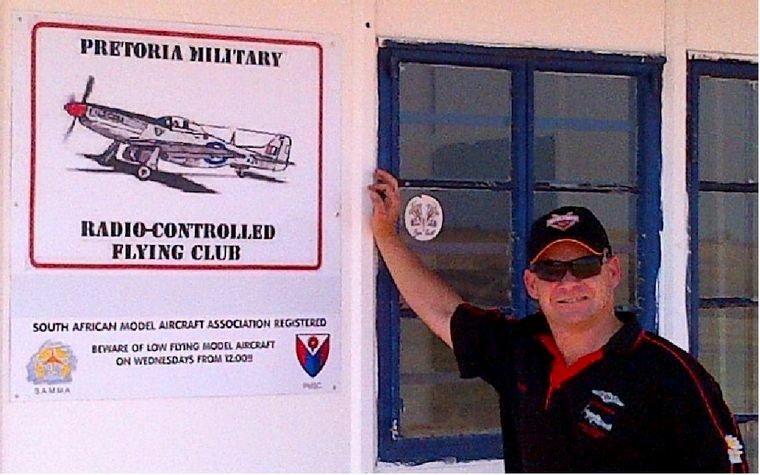 The PMRCFC has also been aided by one of our resident members, Mr Gert de Klerk, (initiator of the annual Warbirds weekend which he started way back in 2000), to present this prestigious fly-in event annually on the flightline of the SAAF Museum at AFB Swkp, He handed the reigns of the Scale Warbirds over to the PMRCFC PMRCFC completely, due to our sound military foundations and origin, as he is aging and would not like to have this fine tradition to vanish into the blue once he cannot do it any more, and the PMRCFC has been running this annual event quite successfully as from 2016. 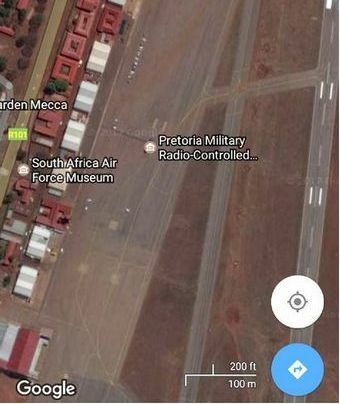 So, to all you "civvies" ou there, please do not attempt to phone the Chief of the SA Air Force on a Wednesday afternoon (especially when you pass AFB Swkp on the R101 "old Jhb road") to enquire why the SAAF has now resorted to operating radio-controlled model aircraft from AFB Swkp, as this will only be the members of the PMRCFC practicing their sport and gracing the skies with their aerial antics from their "base of operations" from the western side of AFB Swkp @ the SAAF Museum. 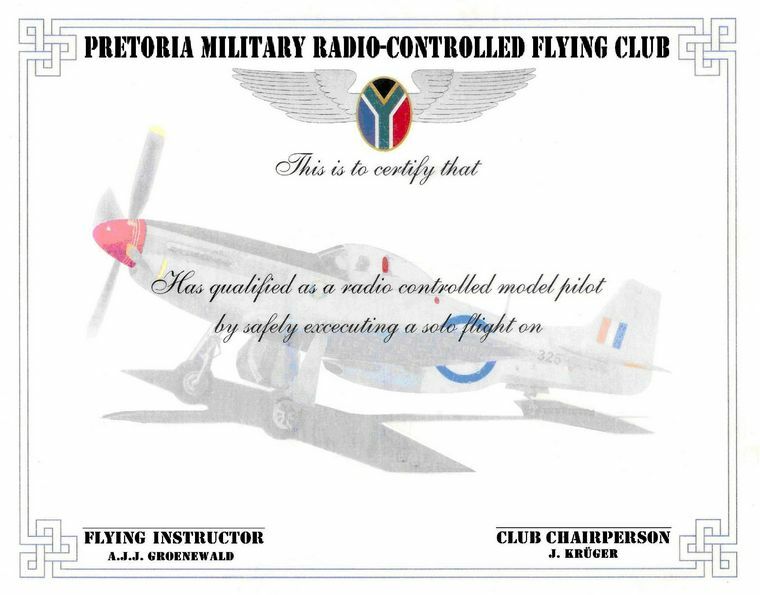 May the PMRCFC go from strength to strength and may it also become another institution destined to become a proud tradition within the SANDF as well as serving to stimulate the interest of many a prospective aviator than can be of service to our beautiful country's military- or civilian aviation sectors for decades to come! For any further information, feel free to contact Warrant Officer Class 2 Johan Kr�ger during office hours (07:00 to 15:30) on (012) 672-3782, or on Facebook @ Pta mrcfc.